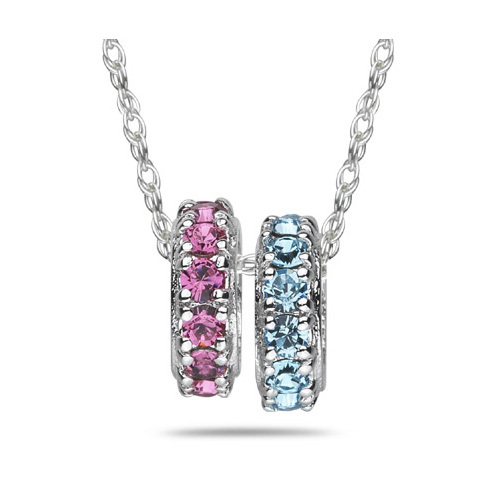 Personalize this unique and fashionable gemstone circle pendant with the gemstones of your choice! Choose how many circle pendants you would like (available from 1-4) set in your choice of 14k white gold or 14k yellow gold. More available by request. Your choice of both natural, genuine gemstones or synthetic gems. Also available with diamonds. Each circle measures 9mm in diameter (approx. 3/8"). Each gemstone measures 2mm in size. 14k white gold Singapore chain in 18" Inches included. Also available with genuine gemstones. We guarantee our Personalized Birthstone Circle Pendant, 14K White Gold to be high quality, authentic jewelry, as described above.